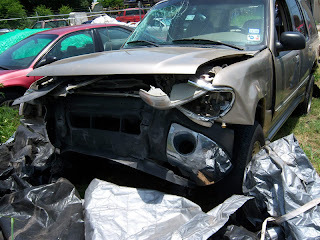 “I survived a rollover in a 2000 Ford Explorer on Interstate 35 at Jarrell, TX, while cruising at 70mph. My left rear tire blew causing the Explorer to go airborne. It landed on its front end deploying the air bag, which I thought had broken my jaw from such a fierce force. The car rolled and landed on the passenger side against the highway-dividing wall facing southbound in the northbound lane.